The Filters feature of the Planning & Dispatching app is used to create and apply filters for both Service Calls and Technicians. Once created, these filters can be used to quickly filter technicians or service calls in order to improve service call outcomes while streamlining the planning process. Note: Skills are managed in the Skills Management tab of the Planning & Dispatching app. The idea behind the Skills module is to allow you to have the means to create a relationship between customer requirements and technician capabilities. Please note that in order to save filters, the username of your Cloud User (i.e. 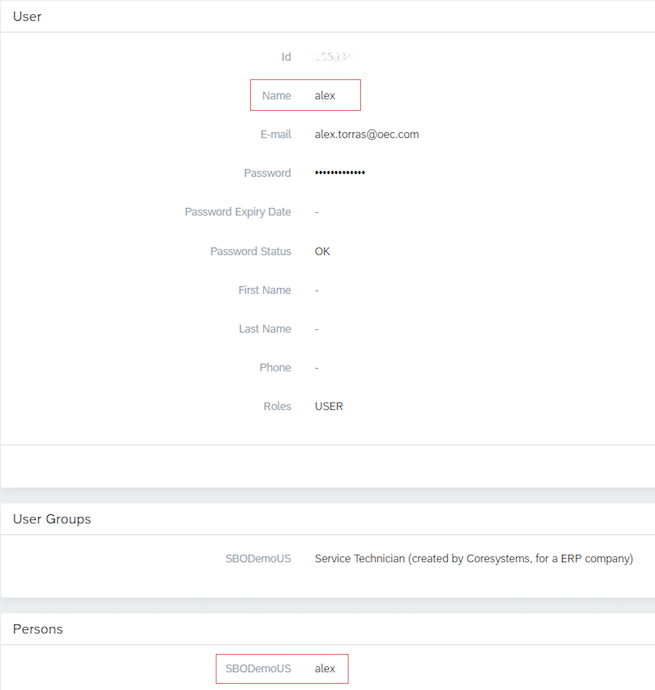 the user record in Admin) must match with the username of your ERP User (the person record in Admin). If the user and person record names differ, you will be unable to save the filters. Technician: These filters are used in order to filter technicians based on the filter parameters. By applying a technician filter, you can more quickly filter out technicians that don’t meet the criteria contained in the filter. Service Call: These filters are used in order to filter service calls based on the filter parameters. By applying a service call filter, you can improve service call scheduling. Activity: These filters are used in order to filter activities based on the filter paremters. By applying an activity filter, you can improve activity planning and management. Filters can be saved, edited, and deleted once created. Note: If a technician filter has been applied and then the Best Matching Technician feature is used, only the Technicians included in the original filter will be queried for best matching criteria. Branch The branch associated with the technician. Code The unique code associated with the technician, technician group, etc. Department Name The name of the department to which the technician belongs. First Name The first name of the technician. ID The ID associated with the technician. Job Title The job title of the technician. Mobile Phone The mobile phone of the technician. Position The position of the technician. Remarks Remarks associated with the technician. Skills Skills associated with the technician. Status The status of the technician. Territory The territory of the technician. User Name The user name associated with the technician. Contains By selecting, the application will filter using "contains" logic to filter applicable records. Does Not Contain By selecting, the application will filter out any records that contain the condition. 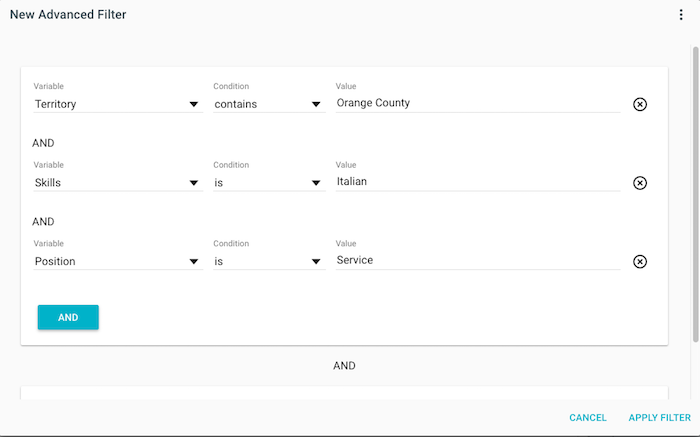 Starts With By selecting, the application will use "start with" logic to filter applicable records. Ends With By selecting, the application will use "ends with" logic to filter applicable records. Filter Name Required. The name of the filter. Once saved, this will display beneath the Technician Filters. It is recommended that you use a descriptive name for ease of reference. Add Condition Required. Here you can add one or more conditions to the filter. This can be any combination of the conditions referenced above. Create By selecting this option, the technician filter will be saved. Successfully saved records can then be edited, cloned, or deleted as needed. Ending Today When applied, will display only the service calls / activities that have a due date with today’s date. Overdue When applied, will display service calls / activities that are overdue, i.e. the due date is before today’s date. High Priority When applied, will display service calls / activities that were marked as high priority. Medium Priority When applied, will display service calls / activities that were marked as medium priority. Low Priority When applied, will display service calls / activities that were marked as low priority. Activity Subject The subject of the activity (example: “generator repair”). Project Code The unique code associated with the project and related activities. Project Type The type associated with the proejct and related activities. Project Subject The project subject (example: “environmental survey”). ZIP Code The zip code associated with the service call / activity. Responsible The responsible associated with the service call / activity. Service Call Customer Name The customer name associated with the service call. Service Call Origin The origin type of the service call (example: “email”). Service Call Priority The priority level of the service call (example: HIGH). Service Call Problem Type The type of problem associated with the service call. These are created and managed in Settings > Service Call > Problem Types. Service Call Remarks Remarks associated with the service call. Service Call Subject The subject associated with the service call. Service Call Type The type associated with the service call. Service Call End Date The planned end date of the service call. Service Call Skills Skills associated with the service call. Service Call Start Date The planned start date of the service call. Service Call Updated Date The date on which the service call was updated. 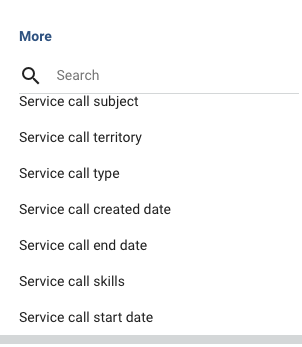 By clicking on the More option, you can select one or more filters to apply to the service calls and activities. These filters use an is/exact match logic and can be saved by selecting the Save Filter from the action menu. Is By selecting, the application will filter using exact match logic. The following guidebook demonstrates how basic and advanced filters can be used. Once a filter has been created and applied, it can then be saved by selecting the Save Filter option from the action menu. The following permissions are required to use the Filters features contained in the Planning & Dispatching app. Add Filter If checked, allows you to add a filter to a service call. Filter Create If checked, allows you to add new filters. Edit Filter If checked, allows you to edit existing filter records. Filter Update If checked, allows you to update/modify existing filter records. Delete Filter If selected, allows you to delete existing filters. Clone Filter If selected, allows user to clone an existing filter.